Background: Nowadays, consumers are more concerned about the issues related to the maintenance and promotion of health, trying to combine the pleasure in the consumption of certain foods with health benefits. Therefore, there has been an increase in the marketing of functional foods. Objective: The present study was carried out in order to explore the consumers’ acceptance regarding the possibility of introducing in the market a new dairy product with functional properties, namely a cheese with berries. Methods: A descriptive cross-sectional study was conducted on a non-probabilistic sample of 335 adult participants. The questionnaires were applied online after informed consent only to adults (aged 18 or over) and the data were collected from August 2016 to March 2017 among the Portuguese population. Results: The results obtained showed that approximately 92% of the participants consumed cheese of any type regularly and 50% consumed cheese two or three times per week. Most of the participants (~62%) revealed that they did not consume any type of cheese with additional benefits. 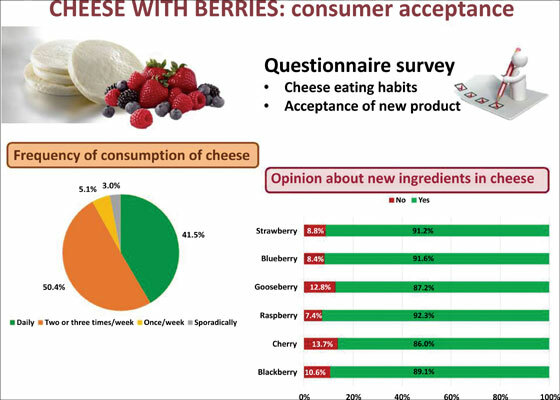 Nevertheless, they indicated that they might be potential consumers of a cheese with berries (~73%) and would like the product to have the ability to improve cardiovascular health (~73%) and have high antioxidant capacity (~51%). The participants involved considered important the addition of ingredients such as blackberry, raspberry, gooseberry, blueberry, strawberry or cherry, and suggested that all the ingredients tested might combine well with cheese. Conclusion: This work showed that the introduction in the market of this new dairy product, a cheese with berries, might be a successful strategy. Acceptance, cheese, consumers, functional foods, health benefits, market study, new product development, survey.